Port Health Services officials in Ogun State have seized and destroyed packs of expired beverages and sausages worth millions of naira. The Ogun and Ondo states’ coordinator of the body, which is under the Federal Ministry of Health, Afolabi Taiwo, said the seizures were made at the Idiroko border and areas around it within the last four months. He said the seizures were made during checks carried out by the personnel of the PHS on the vehicles coming into the country from the Republic of Benin and those travelling from Nigeria and passing through the Idiroko border, to other neighbouring African countries. Some of the expired products were manufactured in Nigeria, while others were made by foreign manufacturers. Also seized were kegs of palm oil which was no longer suitable for human consumption. 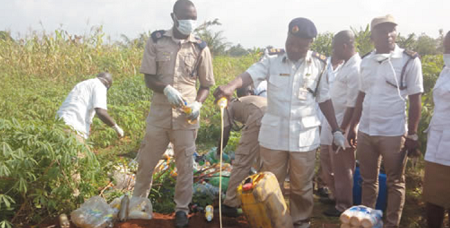 Taiwo, who later supervised the destruction of the expired products at a site in Idiroko, in company with Baale of OjuIroko, Chief Yakubu Akande, said the PHS has the mandate to make seizures of unwholesome products, within 400 metres radius of Nigeria’s border, seaport or airport. He said some of the seized products had expired since 2016, which he explained were injurious to health of the citizens.